ShareCG: CG Guy - Siggraph 2011: Best in Show Winner! Siggraph 2011: Best in Show Winner! This young prodigy began his career as a co-founder of Reel FX Creative Studios in 1995 where he applied his talent and energy to design and special effects for film and TV productions. At FX his clients included Pixar, Troublemaker Studios, Pixar Disney, and Blue Sky Studios. In 1998 Brandon began working with famed author and illustrator, William Joyce in what evolved into a joint creative venture as co-founders of Moonbot Studios in Shreveport, Louisiana; turning the town into the burgeoning new Mecca for all things animated. 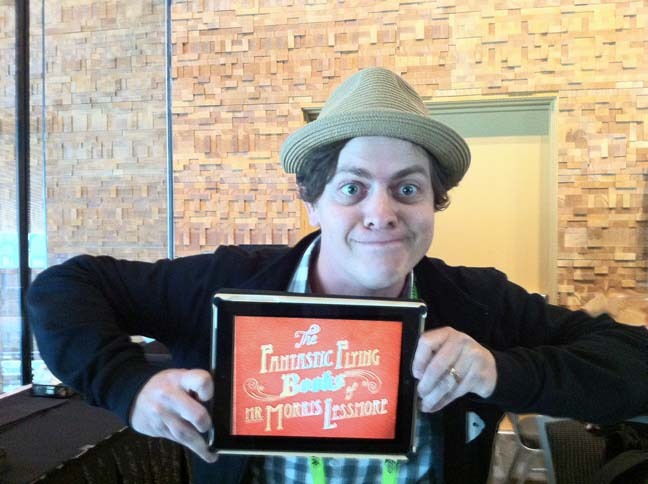 Brandon and William’s short film ‘The Fantastic Flying Books of Mr. Morris Lessmore’ gained critical acclaim and recognition in March of this year after winning first prize for Best Animated Short at San Jose, California’s 21st Annual Cinequest Film Festival. As I wrapped up the interview Brandon handed me his iPad to experience Moonbot’s latest iPad app creation, Bullseye. Bullseye is a collaboration with the musical group Polyphonic Spree that brings their haunting song to interactive life as it lets you explore a day in the life of a stylized pollywog looking for acceptance in a harsh and frantic world. Wow! I had to download this app too, and I’m afraid that if my granddaughter gets her hands on this I’ll never get my iPad back! Brandon kept Moonbot Studios’ future releases under wraps, but I’m sure the work, whether it’s in the form of an animation, an iPad app, both or something entirely new is going to blow your socks off. Stay tuned for more creative surprises from Brandon and his team that are sure to be coming your way for many years to come. This entry was posted on Saturday, August 13th, 2011 at 12:40 pm. You can follow any responses to this entry through the RSS 2.0 feed. You can leave a response, or trackback from your own site.